Is that possible? I know there are people out there who grow their own food but don’t you need a backyard, large balcony or some decent deck space? I’m in the northeast… how can I possible grow my own organic food with the crazy weather we have. Well I decided to find out if its possible after watching a number of documentaries about the crapy food we’re all so use to eating these days. I started by researching how to grow my own produce from my condo year round. Not only is it possible, there are some real easy ways to get started without digging up soil or worrying about green thumbs. There are a number of things that limit what I can grow. First I had to find a place to grow. Luckily I have a loft in my condo that’s separate from the main living area. This is great since my twin girls are just starting to get into that crazy touch & break stage. The loft is my “can’t reach, can’t break” zone. Currently I’m using it as my home office/storage area but there’s plenty of room to get my mini-farm on. So with all that space I figure I can get a couple trees and some table top plants going. But there’s some other things to consider. I’ll need to control temperature and lighting. I’ll only grow things I can keep at room temperature since its an open loft. The lighting will have to sync up with our normal routine at home. Can’t have a nice cozy movie night with a virtual sunshine beaming from the loft. How will I grow them? I found a lot of great info on the web on how to get my mini-farm off and popping. I decided on using techniques from the great minds at NASA. 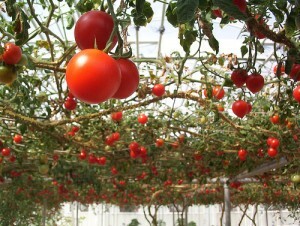 Ever heard of Aeroponics and Hydroponics? These techniques basically take soil out of the equation. This makes growing much easier and efficient. So all I need are some plant lights, water reservoirs, water pumps, tubes, light timers, nutrients, and that staples easy button. This project is gonna take some serious work… I’m gonna break this down into phases. I don’t know how many of these phases I’ll need but for now I’ll just talk about phase one. There are a couple devices out in the market that help you with the whole NASA farm magic thing. The first that came to mind is the Aero Garden. I saw the infomercials a while back. Got one from Amazon last year. 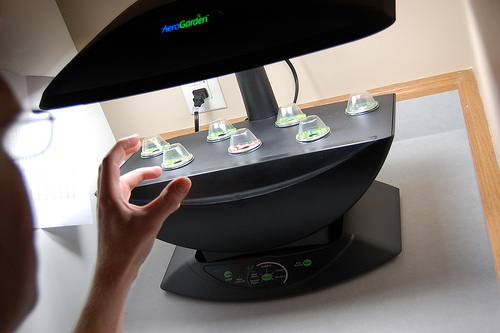 The Aero Garden is a cool table top appliance that makes hydroponics easy. I can’t think of a better way to start. My plan is to learn the basics with this gadget and then build my own system down the road. There are other products out there but based on my internet surfing this is probably the way to go for now. I own the Aero Garden Deluxe which has 7 slots for planting. I originally choose this one because the lamps extend higher and I get the most slots for the money. My first run with this was terrible since I didn’t really take it seriously. I think I ended up with about 14 cherry tomatoes that I never ate. This time I’m gonna get focused. Back to the Tomatoes. The last time I screwed up the nutrients. I didn’t know they were split up into stages (starter, growth and fruiting). I also think I should only plant two pods on opposite ends of the reservoir since the cherry tomatoes got pretty big. Don’t want them to fight for light or root space. In my next post about this project I’ll go into more details on starting this first phase with pictures and all. Let me know what you think about this idea, the project and anything you might be doing like this. hey this sounds cool and all, but are you really into gardening or is this something you’re just experimenting with? if i had a garden i’d be growing medicinal marijuana ;-) … can you do that with this thing? @rey I don’t know… can’t say I’m into it just yet. This is definitely an experiment to see if it’s something I’ll pick up. funny you ask about the marijuna… I’d say about 70% of the information I came across was about growing weed. It’s all over the interwebs. I’m gonna keep this legal though… me and jail don’t mix. Can anyone give me feedback on the AeroGrow system?